History of Eastern Woodlands Style Quillwork. The native peoples of the eastern woodlands used Porcupines quills to fashion into what is called today Porcupine Quillwork. Eastern style quillwork is one of the most fascinating art forms using quills prior to the use of modern day beads to create multiple items like neck sheathes, Bags, moccasins, even prisoner ties were adorned with quillwork. Quillwork was also used by native people in the west on the plains. The earliest form of quillwork was the use of bird feather quills being stripped down and dyed and sewn onto sealskin items used by the eskimos/Inuit as a form of adornment. The Eastern people used quillwork to convey Totems, Manitous, and visions on items worn by both Male and Female members. It would adorn clothing, bags, knife sheaths, gustowas and moccasins along with many other items.The most common techniques are The Zig-Zag, Line, and The Oblique. quillwork must not be confused with Moosehair embroidery though sometime the 2 overlapped on some items. Go to your local native museums and find There eastern collections and compare them with the western collections and you will see the similarities but also, there differences. Enjoy The research. 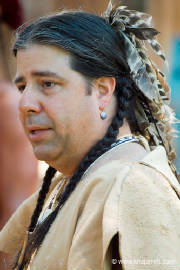 I am a Tribal member of the Elnu Abenaki Tribe of Vermont /and Eastern Band Qualla Cherokee , I am a 17th and 18th Century Woodland Interpreter as well as a member of the Native Living History group The "Woodland Confederacy" we Interpet the Western Abenaki who lived and fought during the French and Indian War 1750-1763. 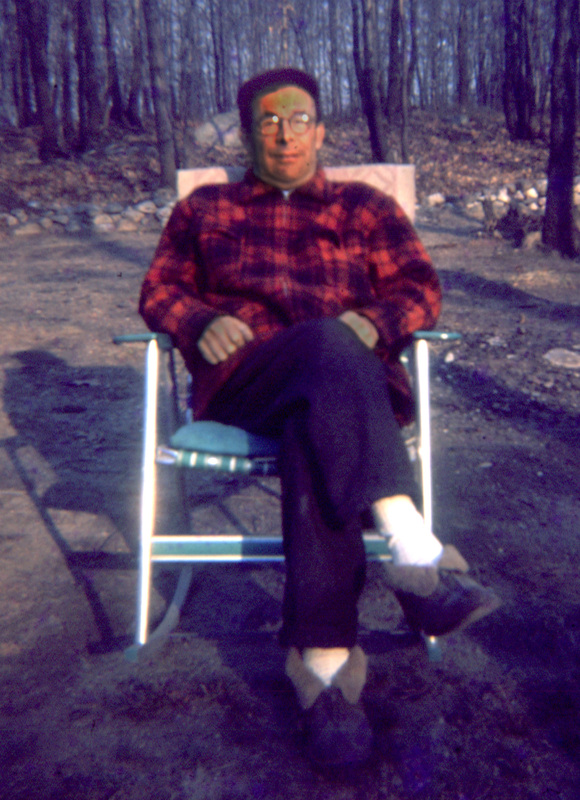 I interpet my ancestors as an Abenaki Warrior from this time period. 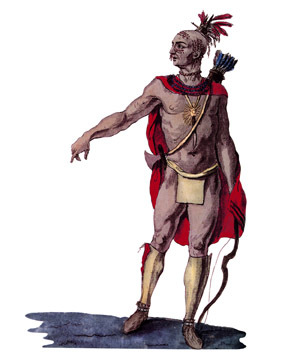 The Woodland Confederacy and it's members are mostly made up of Elnu Tribal members and others are of other Native tribes along with a few Non - Native members . 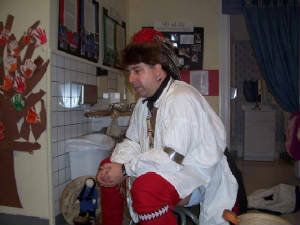 I like to teach and educate people about The Eastern Woodland Indians from our area and beyond using stories, visual aides and music. I have been involved in Living History for the past 17 Years. My oldest daughter Ashley (Morning Dove)14yrs along with her lil sister Jillian (White Shell)9yrs have been active reliving their culture as native Girls with me on our travels to some of the most historical sites in the US and Canada. 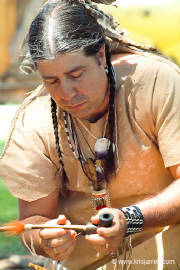 I am and Eastern Woodlands Quillworker, Porcupine Quillwork was a practiced art form used during this period.I have been doing quillwork for the last 22 years, My work has been featured In Muzzleloader Magazine,and displayed in Museums here and abroad. Many are aware that I am the quillworker who made the Mark Baker Sheath. I make many quilled items from the F&I and Rev war periods, from quilled pipe stems to Gustowas,Knife Sheaths both neck and sash. Bags made in many different designs etc. Just to name a few some are displayed in the photo album page look and see if there is anything that you like.